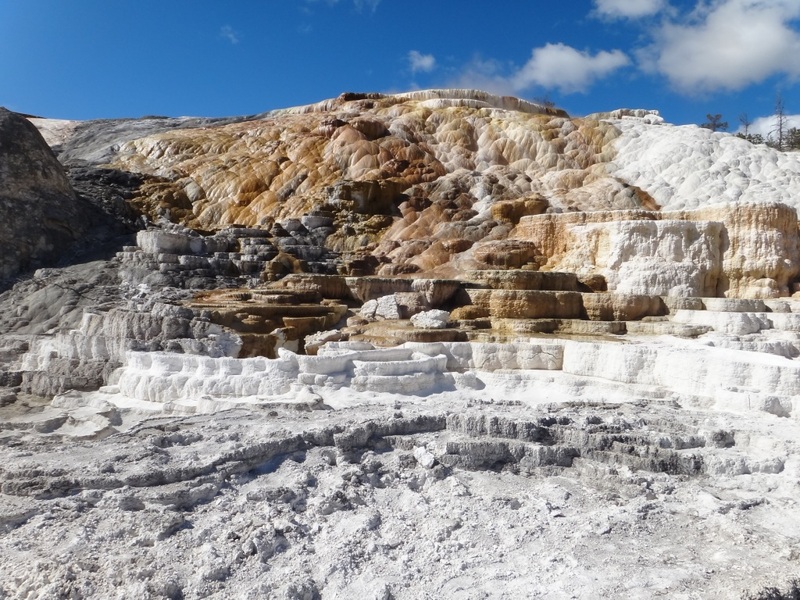 Photograph 1 - This is The Terrace taken at Mammoth Hot Springs, Yellowstone National Park, Wyoming. 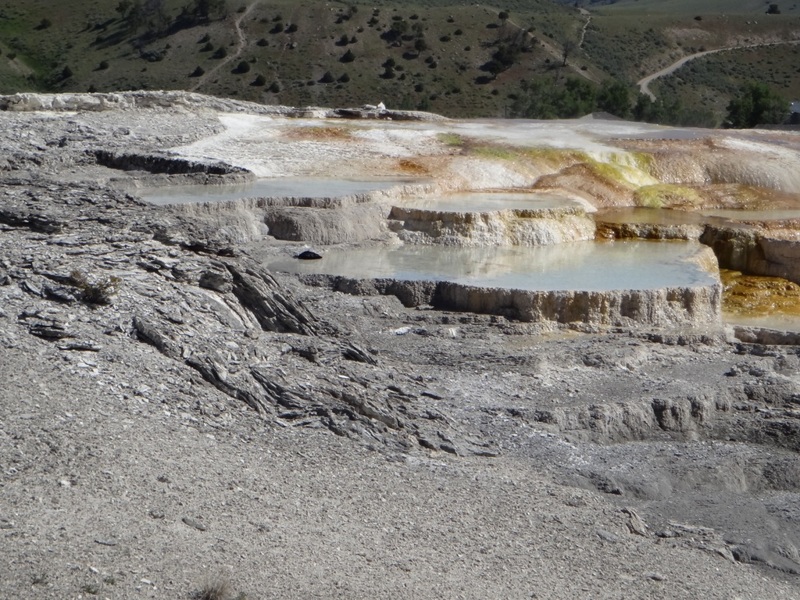 Photograph 2 - The hot water collection pool at Mammoth Hot Springs, Yellowstone National Park. 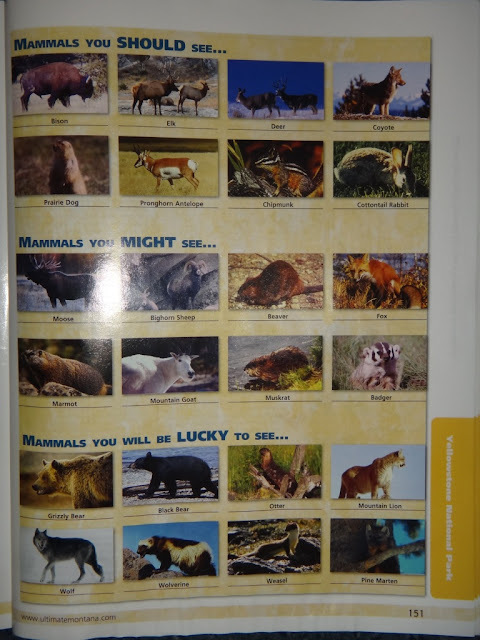 Photograph 3 - A leaflet from the local rag, indicating how lucky you are to see any bears in Yellowstone National Park. 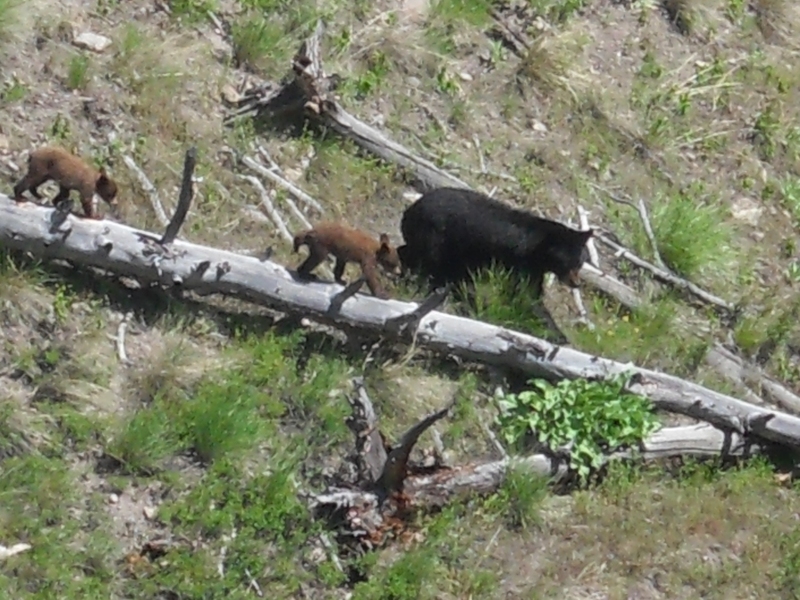 Photograph 4 - A black mother bear with two cubs in the wild. Taken near Blacktail Ponds, Yellowstone National Park. 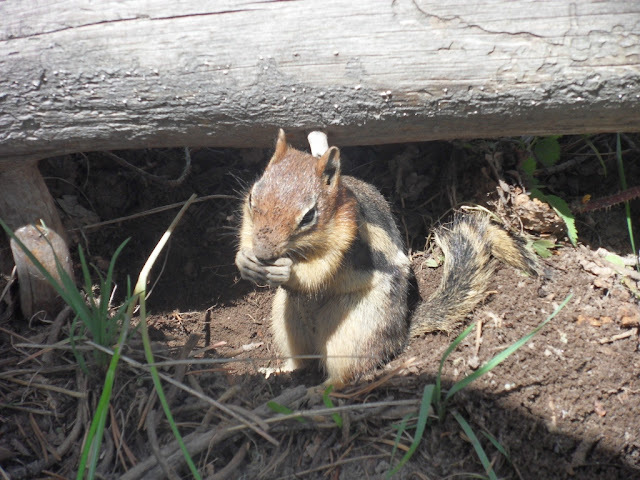 Not just your average picture taken from the "show mammals" located in the Bear Park just outside Yellowstone NP. This is the real McCoy! 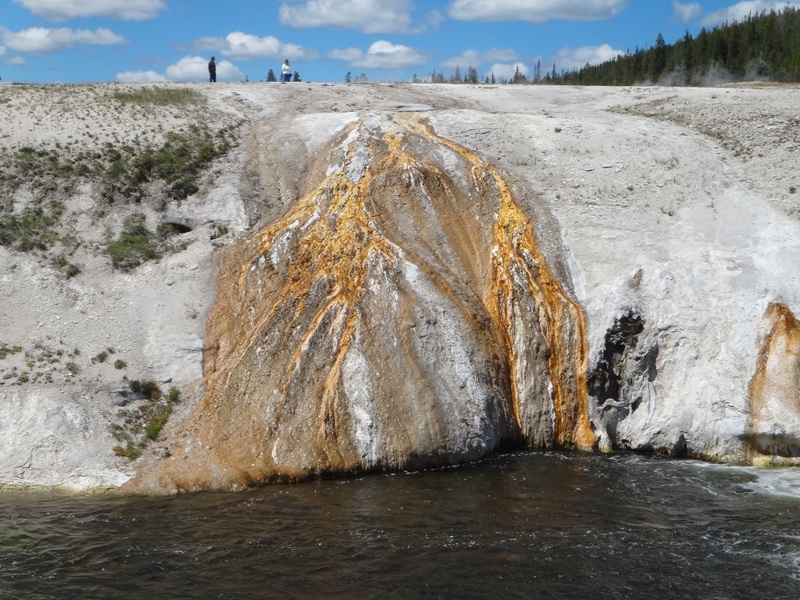 Photograph 5 - The ice is still around in Yellowstone. Taken on the Mount Washburn 10,250 feet. 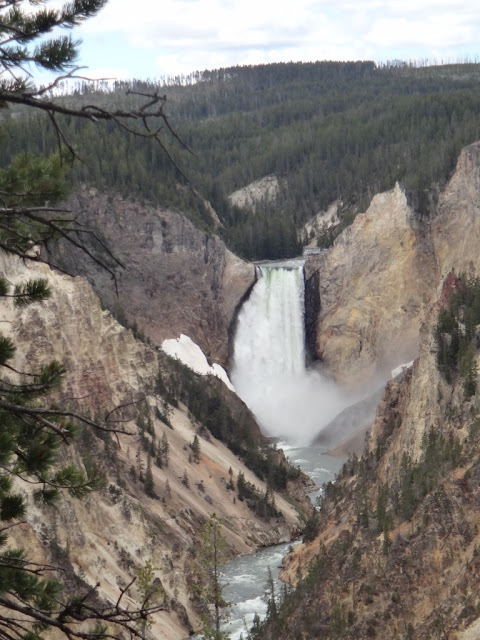 Photograph 6 - A frontal shot of Tower Falls in the Grand Canyon of Yellowstone. 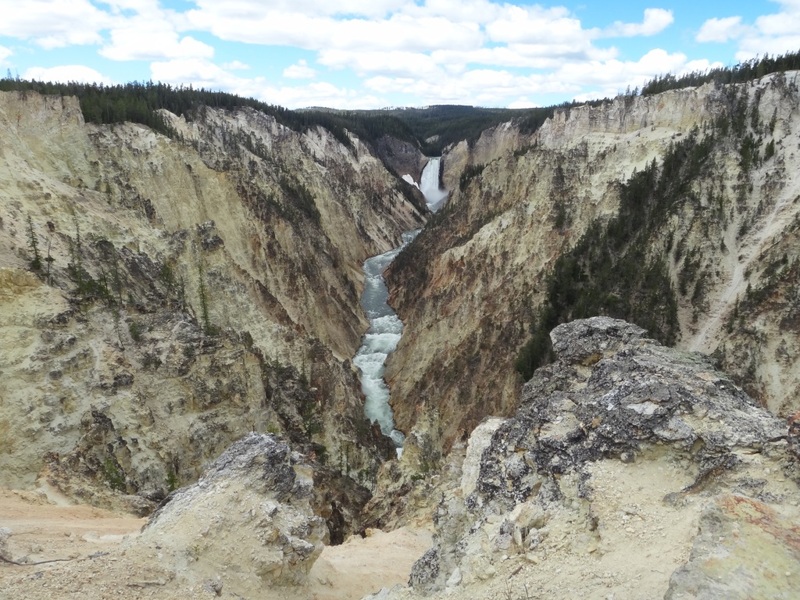 Photograph 7 - Another picture of Tower Falls showing the canyon and Yellowstone River. Photograph 8 - View of the Absaroka Range and Yellowstone Lake. Taken from our lunch site Yellowstone NP, Wyoming. Photograph 9 - According to our Yellowstone booklet - this is a Mule Deer, taken near West Thumb, Yellowstone National Park, Wyoming. 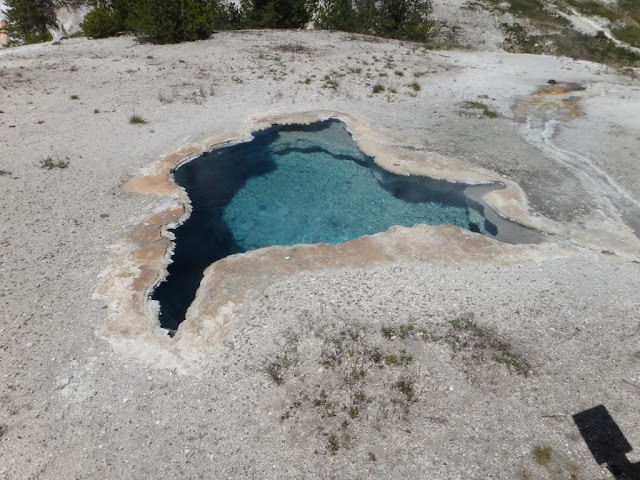 Photograph 10 - One of the blue hot springs, located near Old Faithful, Yellowstone National Park. 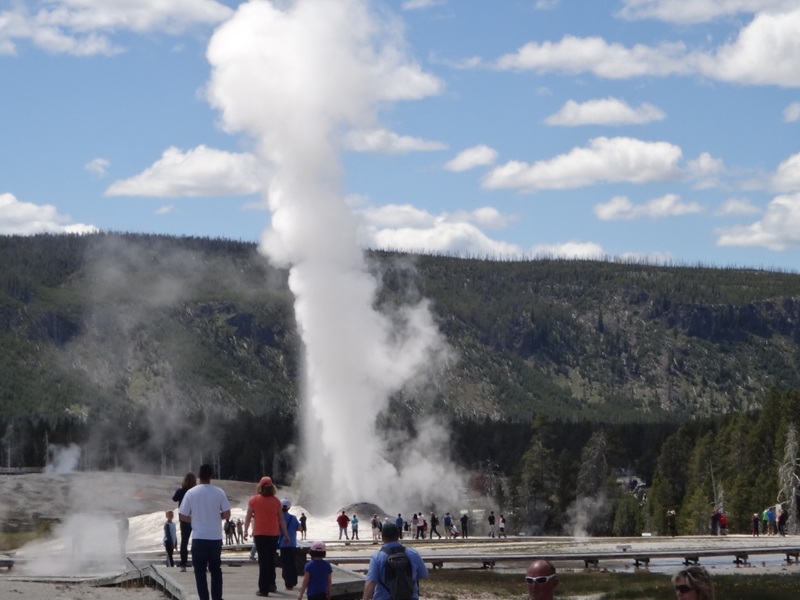 Photograph 11 - One of the many "erupting" geysers on Geyser Hill located near Old Faithful, Yellowstone NP. 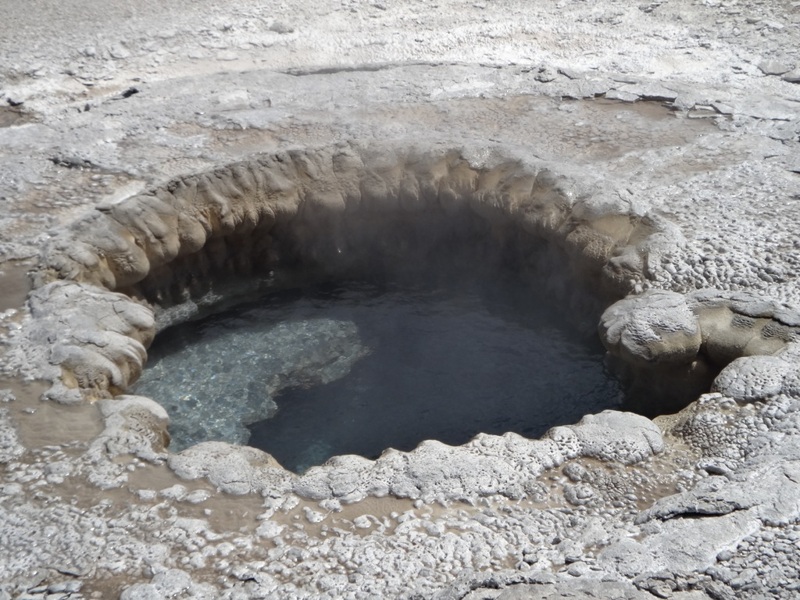 Photograph 12 - An old geyser turned into a hot springs - taken near Old Faithful, Yellowstone NP. Photograph 13 - Sulphuric overflow near Old Faithful, Yellowstone NP. 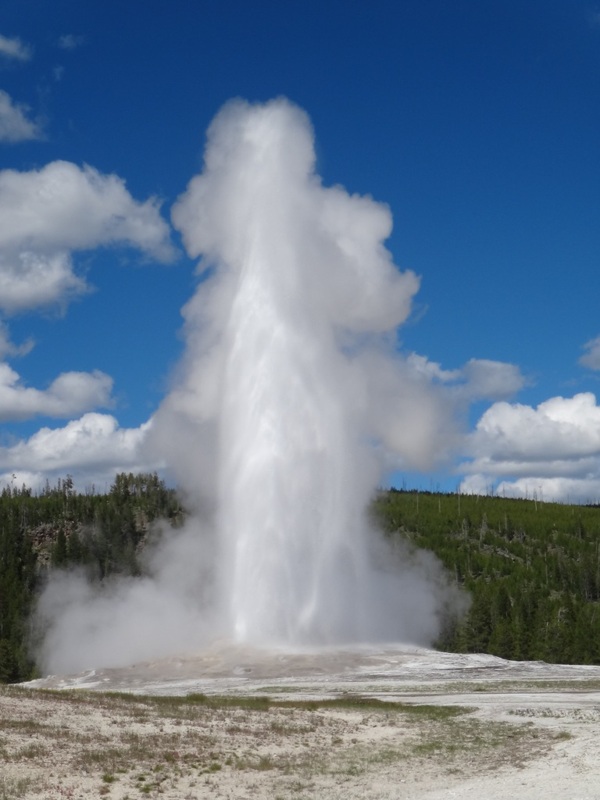 Photograph 14 - Old Faithful in full bloom 3:56pm, Yellowstone NP. 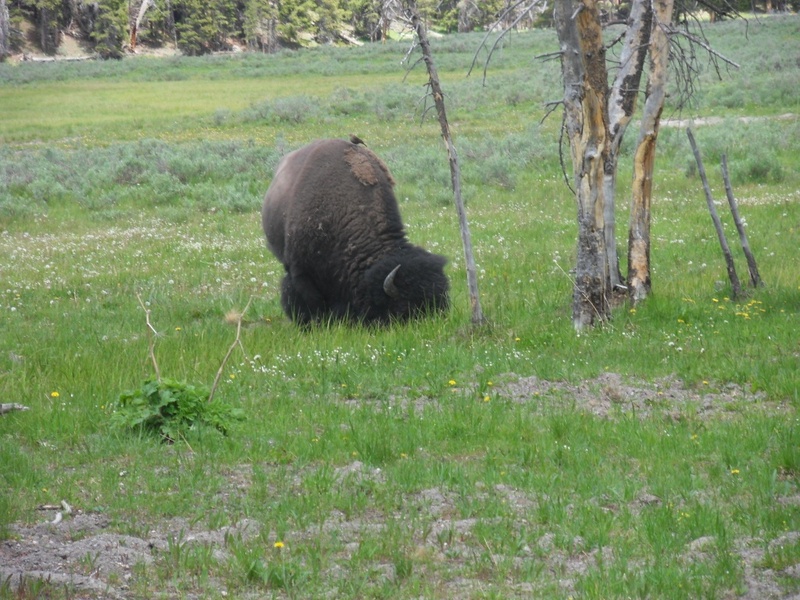 Photograph 15 - Just one of the many bisons (buffalo) inside Yellowstone National Park. Photograph 16 - A chipmunk at Old Faithful, Yellowstone NP. Photograph 17 - The main street of Gardiner, Montana. We had a good time time today. Left at 9:30am from Gardiner and did the loop around Yellowstone National Park. We returned to Gardiner at 6pm after stopping at many wonderful sites in the Park. The Yellowstone NP is huge. To drive around the park takes hours - something like 200 miles in total. Our first stop was the Mammoth Hots Springs - which was okay. 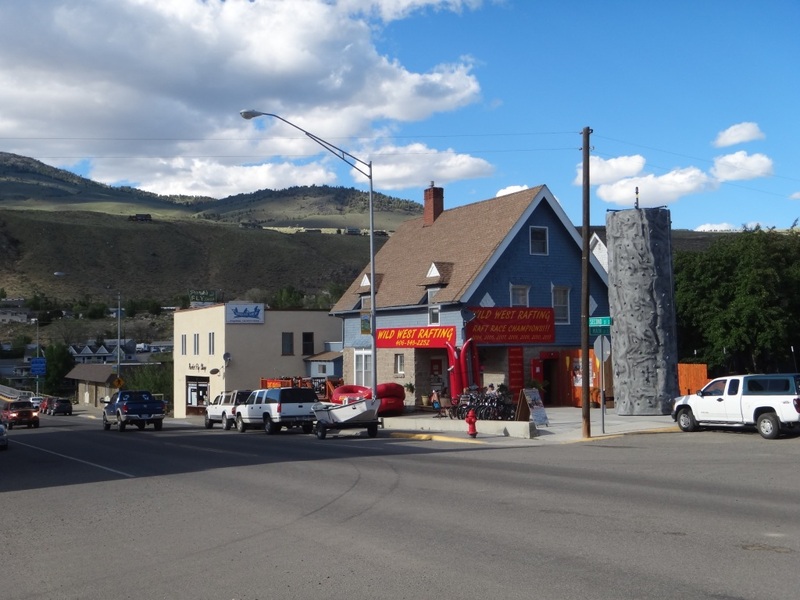 There is a big lodging complex located there which is rather like a medium size town. Then we headed towards the eastern entrance (a well known bear siting road). At about 20 minutes into our drive there was many vehicles topped on the road (we couldn't pass anyway) and there was a mother black bear with two brown cubs just foraging around about 200 metres across a gully. They knew we were around but couldn't care less. Mum was very careful with her young-uns thou. 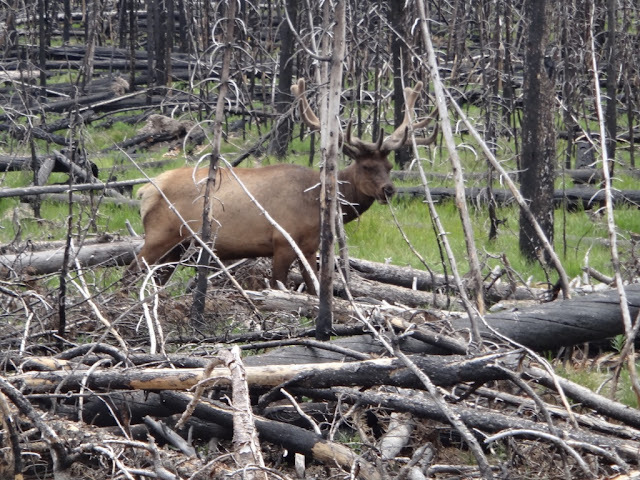 To see these wild beasts in to the wild is quite an emotional experience. It made our day. Apparently, it is rare to see these animals like this from the roadside. Only hikers and campers have the privilege in seeing bears in the wild as an expectation. Interestingly, two hikers were killed last year by bears in Yellowstone NP because they didn't heed the warnings. We have in our booklets that if you are detected by a bear and are attacked, raise your arms to be bigger than him/her, make a noise, and don't run away. If you are attacked FIGHT BACK - right!! Well after about 45 mins taking many photographs we headed to Tower Falls and the Grand Canyon of Yellowstone. Great sites. 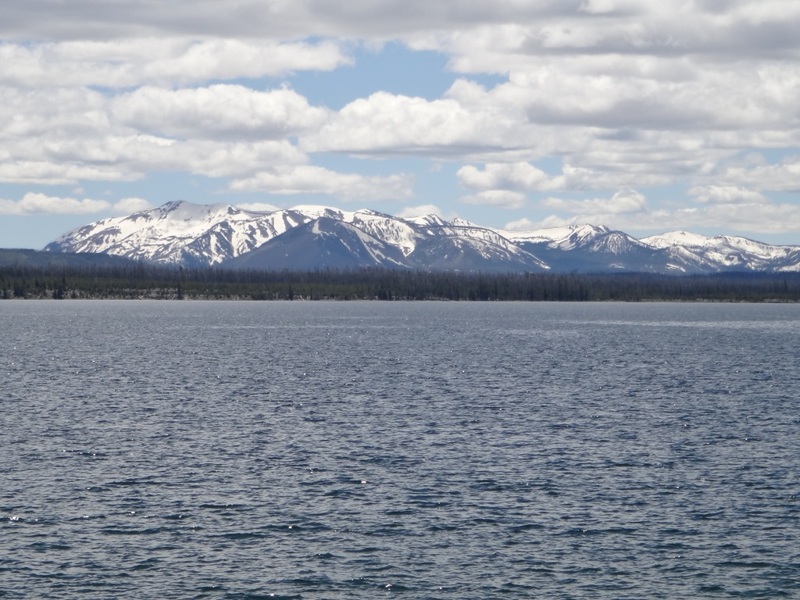 We had lunch next to Yellowstone Lake and hence to Old Faithful geyser. On our arrival we just missed an eruption. It takes one hour before the next predictable show so we wander around the geyser field nearby. The amount of hot springs and smaller geysers are awesome. At 3:56pm Old Faithful gave us a show and wow - not only seeing black bears but Old Faithful as well - it made our day. We believe to fully appreciate Yellowstone National Park you would need to spend at least one week here. That includes hiking into off-road sites. Tomorrow we have a ten hour drive to the Black Hills of Dakota. 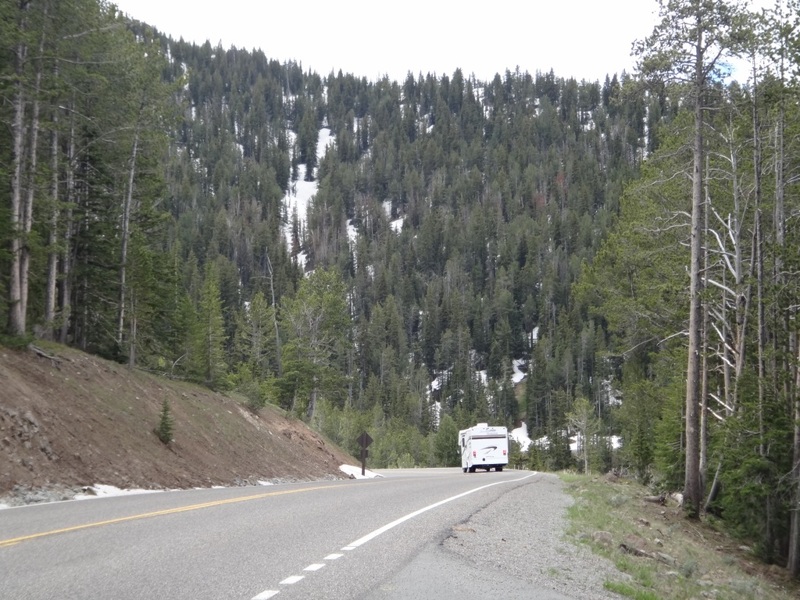 We need to leave early and to leave Gardiner we drive through bear country again in Yellowstone - hopefully we may see more bears - a Grizzly perhaps. See yah and cheers.